A great thanks goes first and foremost to all of those who have continued their support to the TarWheels and those who have just begun in their support! The organization and especially the athletes in the organization are all grateful to have been given the opportunity to compete for another year! This basketball season has now come and gone, it was an opportunity to introduce new players to the game of wheelchair basketball and continue offering sports to many more! Our most recently joined rookies from the last couple years had an opportunity to really step up their game and they most certainly have! The experiences had for all of the TarWheels continue to be a great time! Growth in the form of new sports, fans, sponsors, and community involvement for the group are constantly bringing excitement to what the TarWheels' future holds! As for the past, well, we were waiting to see what the National Wheelchair Basketball Association, NWBA finally came out with as far as rankings. The national tournament was set up in a double elimination format. Unfortunately for the TarWheels' final standing, it's apparent that the rankings were not done with much attention to detail. After winning the first game against Music City's Lighting Bolts, The TarWheels were put out of the winner's bracket by the Detroit Die Hard team. On a plus side, Detroit went on to win the entire tournament without suffering a loss. Once in the loser's bracket, it was still possible to win one's way back the final championship game, however, the TarWheels were unable to do so and took a loss to Houston TIRR Hotwheels. Again for the TarWheels, it was refreshing to see a team that such a close game was played against go on and finish fourth in the tournament. The TarWheels were among the top eight teams before moving to the loser's bracket, the final ranking for The TarWheels should have been somewhere between fifth and ninth, however the team is listed as 12th on the final bracket. In each of the games that the team took part of it was great to see the team coming together! Even with season points leader, Donnie Langford, below optimal heath, the rest of the team stepped up and played their hearts out! It was disappointing to come away without having made it further in the bracket, but it was a very enjoyable time, a great experience, and many notes were made to prepare for next season! There was one tournament winner for the TarWheels though! Pete Morgan was entered as the one player per team to compete in the shooting contest put on by Per4max wheelchairs. 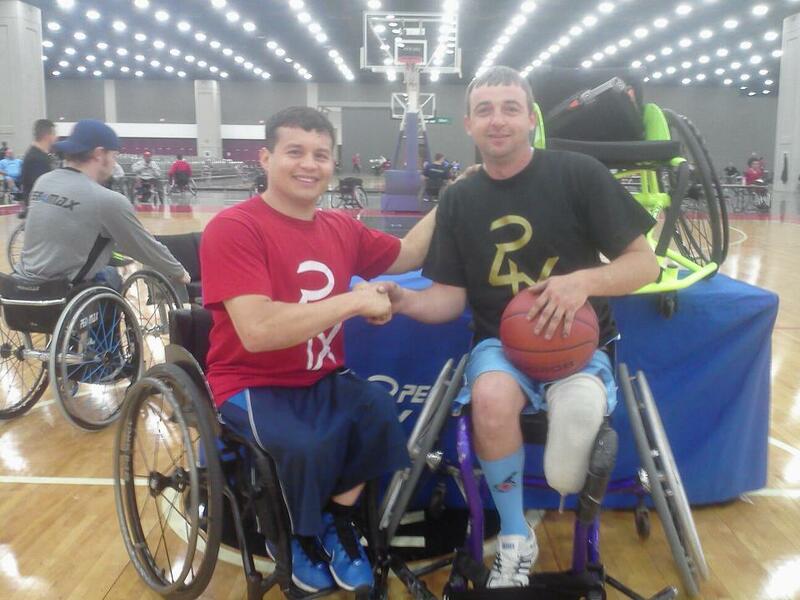 Pete knocked off one opponent after another in head to head battles and won himself a custom fit Per4max basketball chair! Finally being in a chair made for him, The TarWheels look forward to seeing Pete's game continue to grow by leaps and bounds! Pete Morgan (right) shakes Per4max Medical owner, Willie Hernandez's (left) hand after just winning the Per4max shooting competition and a custom fit Per4max sports chair! The TarWheels organization has already been approached by and is looking forward to welcoming several new members for the upcoming seasons of basketball and softball! It seems like this time of year brings in many new faces and is great to unwind from basketball with some outdoor sports and activities! Softball will be starting up this week! The first practice of the year will be held on April 30th and practices will be held every Tuesday from here on out as well as a couple Sundays per month! For details on how to play or get involved, please contact us and we look forwards to having new new faces! Our schedule page is updated as new events are planned. Thanks for following the basketball season here on The TarWheels' official website! Make sure you've clicked both Facebook links and show your support at our Facebook like page and join our group page as well! The like page hasn't been around as long, we need more likes! We'll be updating you soon with up and coming softball, handcycling, and other sporting events coming up over the summer!